李永亮, 赵欢欢, 李荣华, 王春琳, 母昌考, 宋微微, 叶央芳. 2019. LI Yong-Liang, ZHAO Huan-Huan, LI Rong-Hua, WANG Chun-Lin, MU Chang-Kao, SONG Wei-Wei, YE Yang-Fang. 2019. Oceanologia et Limnologia Sinica, 50(2): 465-472. LI Yong-Liang, ZHAO Huan-Huan, LI Rong-Hua, WANG Chun-Lin, MU Chang-Kao, SONG Wei-Wei, YE Yang-Fang. 2019. COMPARISON OF AMINO ACID AND FATTY ACID COMPOSITION IN SCYLLA PARAMAMOSAIN FROM SIX DIFFERENT WILD POPULATIONS[J]. Oceanologia et Limnologia Sinica, 50(2): 465-472. Abstract: In this study, we analyzed the amino acid composition and fatty acid composition of Scylla paramamosain collected from six different wild populations:Qinzhou, Guangxi Province (Gq); Xiapu, Fujian Province (Fx); Wenzhou, Zhejiang Province (Zw); Sanmen, Zhejiang Province (Zs); Ninghai, Zhejiang Province (Zn); Cixi, Zhejiang Province (Zc). A total of 19 free amino acids and 26 fatty acids were identified from 6 populations. The amino acid content ranged from 80.94-191.39mg/g, the highest amino acid content was detected in Gq population; the total fatty acid content ranged from 7.97-11.38mg/g, the highest fatty acid content was detected in Zn population. The main amino acids were glycine and arginine, and the main fatty acid was C20:5n3 (EPA), which accounted for (22.47±5.84)% of total fatty acids. There were abundant flavor amino acids and polyunsaturated fatty acids in all the populations, which accounted for (53.62±5.43)% of the total free amino acids (TDAA/TFAA) and (59.27±5.29)% of the total fatty acids (PUFA/TFA). 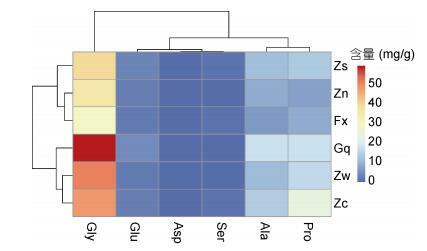 The highest essential amino acid contents and C22:6n3 (DHA) were found in the Zs population. Principal component analysis showed that the composition and content of amino acids and fatty acids were correlated with geographical distribution of these populations; especially in Gq population, the similarities of amino acids and fatty acids were more distinct from other populations. 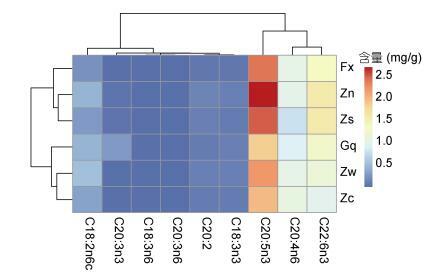 The results of cluster analysis of flavor amino acids and polyunsaturated fatty acids showed that Zw, Zc and Gq populations were grouped in a clade and had strong sweetness, while Fx, Zn and Zs populations were grouped in another clade and had strong aroma and nutritional value of unsaturated fatty acids.